A lush wedding garland made with several different foliages and adorned with fresh flowers is one of the most beautiful and versatile ideas for a wedding ceremony or reception. And not to mention they are really hot wedding decor item right now. This video will walk you through the steps it takes to create a gorgeous wedding garland like this one, using just a few basic tools and supplies. You’ll be surprised to learn how easy and cost-effective it is to make a fresh wedding garland, using the techniques and tips shared for mixing flowers and foliages. 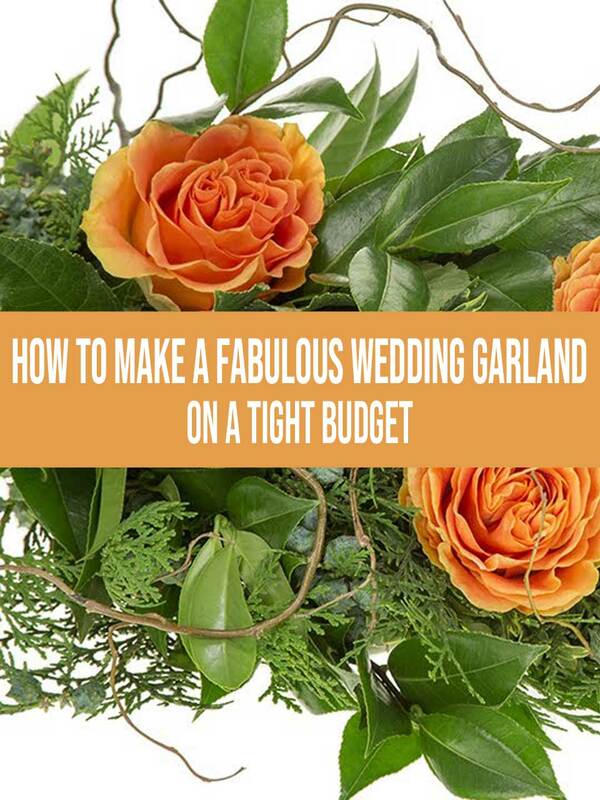 It’s a video I think you’re going to really like, especially if you have been thinking about making a fresh wedding garland yourself. Watch it and see if you agree. I trust you enjoyed the tutorial. Making a beautiful wedding garland is really not that difficult, and once you get started, it actually does go pretty quickly. While we’re on the subject, all of the flowers and greens used in this wedding garland can readily be found online. You can find wholesale flowers and foliages at BloomsbytheBox, GlobalRose and FiftyFlowers. These 3 are the ones that I’ve had personal experience with. There are several other online floral wholesalers that look great as well, but I can honestly say I have no personal experience with them. If you want to substitute or add some silk flowers rather than fresh, you can find an outstanding selection online at NearlyNatural, and at many craft stores such as Hobby Lobby and Michaels, or by ordering them through your local florist. One other bit of advice, if I may. Because you are using fresh foliages for the garland, go ahead and substitute silk flowers if you want to. They will look great, as the fresh greens will keep your wedding garland retain its lifelike appearance. Okay, to start on the right foot, I’ve gotta level with you. Truth be told, the main reason this site exists is a selfish one. See, I run across a lot of video tutorials (like the wedding garland video you just viewed), and I honestly just wanted a place where I could share my favorites under one roof. If I’ve got the ability to build a fun and useful video site that others like anywhere near as much as I do, and I can perhaps monetize it a little bit, then I personally don’t see an issue. So please visit again ASAP! I’ll simply keep sharing awesome videos covering flowers, plants, and weddings… and that’s just for starters. And lastly, I love reading your comments and questions. So please do use the comments section below to let me know what you thought of the wedding garland video!